Sky events for this month & objects for observation and can be found here. Click to enlarge. A larger printable version of this chart can also be found here. ​March 31 to April 6 - International Dark Sky Week. The first week of April will be celebrated around the globe as International Dark Sky Week. This will be a great week for people of all ages to head to a dark area where there is less light pollution, such as a local park, to gaze upon the night sky. Milky Way & meteors - Central Idaho International Dark Sky Reserve. Photo by Oliver Guy. April 22-23 - Lyrid Meteor Shower. April 22 is widely known as Earth Day, but many stargazers should also mark the Lyrid meteor shower on their calendars as it is the first major meteor shower since January. The Lyrids will be the strongest shower since the Quadrantids of early January and puts on a show for about three nights surrounding the peak night. The radiant point of this meteor shower is located near Lyra, the constellation for which they are named, but meteors will be visible in all parts of the sky. 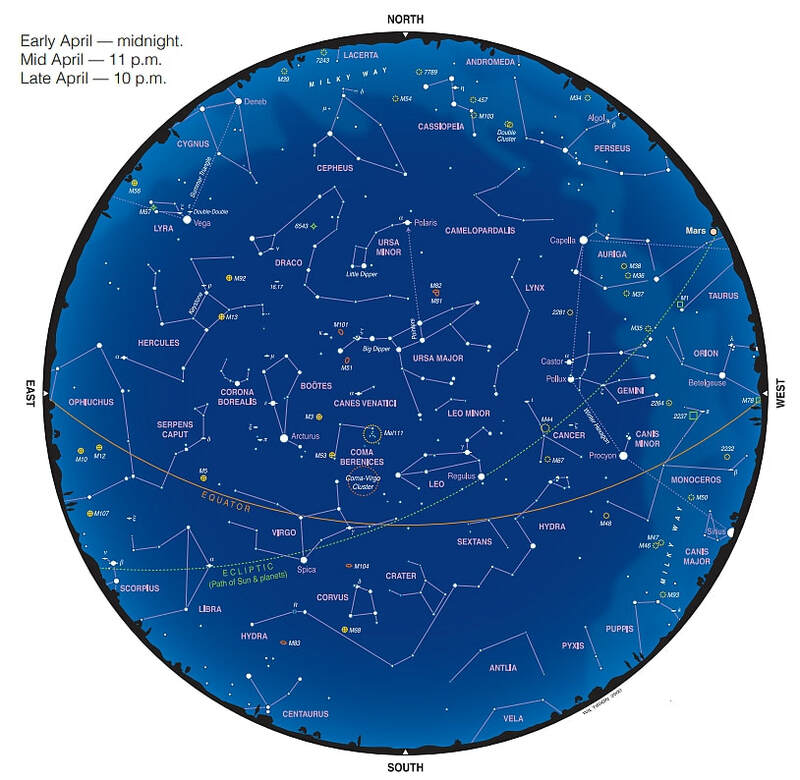 This year, the peak night is expected to be Monday, April 22, into the early morning of Tuesday, April 23. Typically, onlookers observe around 20 meteors per hour; however, this year it may be slightly lower due to light from the nearly full moon. This natural source of light pollution will make it more difficult to see the dimmer meteors.